Do you remember reading The World is Flat by Tom Friedman? He wrote the book 14 years ago, explaining how several technological advances had come together to spur globalization, create a global marketplace, and effectively shrink our planet. We tend to associate globalization with the need for cross-cultural competence. 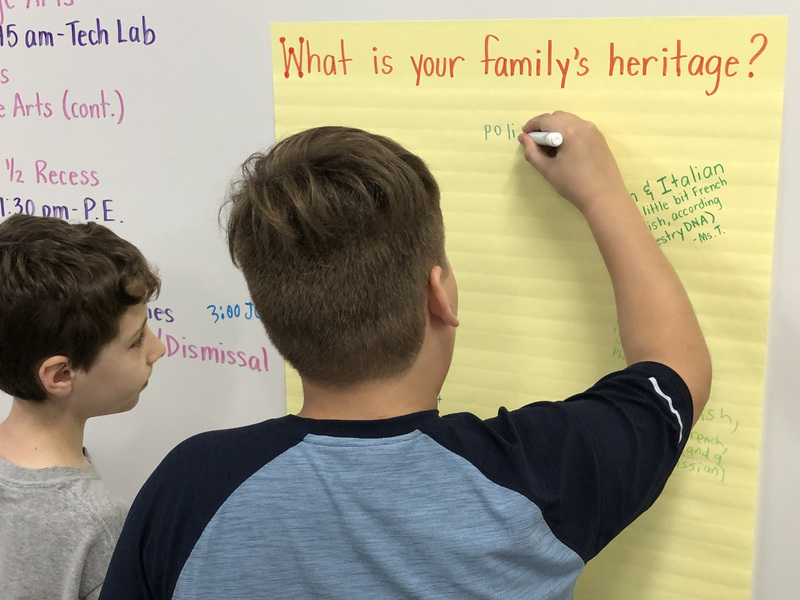 To be sure, many in educational circles recognized the benefits of seeking to understand other cultures and perspectives long before “globalization” entered our lexicon. Yet Friedman’s work, which described an increasingly interconnected world, added practical and economic reasons to focus on our receptivity toward those different than ourselves. As articulated in our Statement of Diversity and Inclusion, we at TDS “are committed to creating awareness, developing cultural competence, and building a diverse and inclusive environment where all persons are valued for their unique qualities.” While much of this awareness and competence stems from our curriculum – what we investigate and what we read – we also are fortunate to have many different cultures represented at TDS, and we dedicate time to learning from one another. Today begins International Week at TDS, five days focused on exploring cultures and customs throughout the world, many of which are seen in our own families. Students will be learning about the many elements that make up culture. What customs and traditions does your family practice? What beliefs are important to your family? Of course, all of this leads up to our signature event, International Festival, which takes place next Friday. Many of you have volunteered to contribute to our International Cafe; students in each grade will sample cuisine – and in many cases family recipes – from around the world. 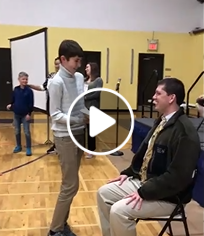 At 1:00, parents are invited to join us in the gym, where Lower School students and the Middle School chorus will sing songs in Spanish, Swahili, Yiddish, Korean, Polynesian, and Japanese. The day concludes with students in all ten grades attending workshops run by teachers and parents. Lower Schoolers will have opportunities to create Rangoli art from India, explore folk art from Mexico, learn to salsa dance, play steel drums from Trinidad, speak in Welsh, cook traditional Cuban cuisine, and much more. Meanwhile, Middle School students will learn traditional drumming techniques from the Congo, get their bodies in motion as they practice various Latin dances, and cook classic Mediterranean dishes before sampling what they create in the kitchen. Thank you for sharing your stories, customs, talents and expertise with us at TDS. It’s both obvious and important to note that our push to explore, appreciate, and understand the great diversity that exists, both in the world and at TDS, is not confined to International Week. 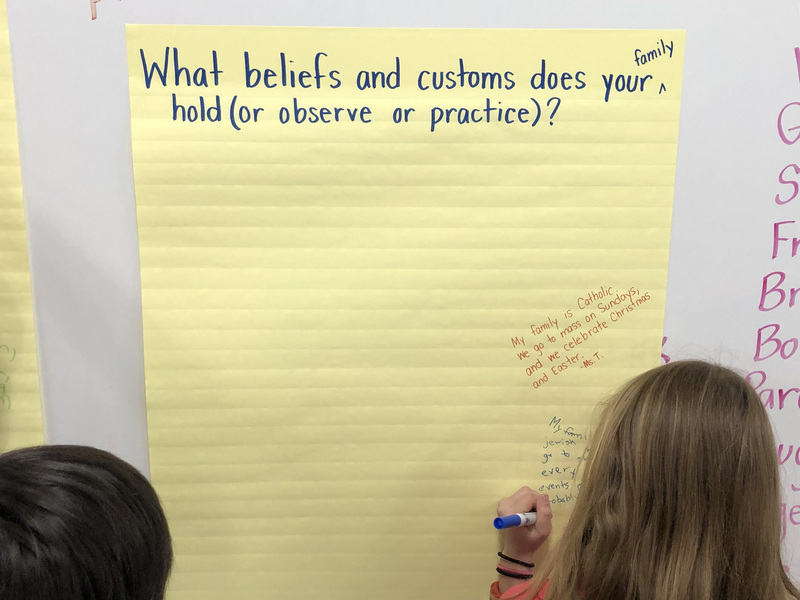 Just as science and math take place beyond Science and Math Weeks, our exploration of cultures is woven throughout our curriculum. Earlier this week, I received the Amherst magazine (Spring, 2019), a semi-annual publication that typically has me flipping first to the Alumni Notes to catch up with my classmates. This time, the cover story caught my attention: How To Be Happy. The article turned out to be four different stories, each with its own perspective on happiness. Eager for nuggets of wisdom relevant to my personal or professional life, I began reading. #1 – Read Melville. This piece, written by a recent graduate, highlights an Amherst professor’s new book on the great American author. While I appreciated the focus on the importance of reading – “everyone needs a sense of the value of what has come before” – it’s hard for me to imagine that Ishmael’s fictitious account of the obsessive quest of Captain Ahab would hold the attention of our middle schoolers. After all, the novel didn’t rise to prominence until well after Melville’s death. #2 – Change careers. Unless the Washington Nationals need a long reliever who throws in the mid-40s, I’m not giving this serious consideration. That said, I enjoyed the story of Cristian Hinojosa, the banker turned fire chief and paramedic. Hinojosa’s description of fire fighting as “feeding [his] soul” suggests that he made a personal choice in accordance with the final chapter of the TDS mission statement. That is, he is leading a life of purpose. During Career Month, our students hear from many alumni and parents about what they do, and why that work is meaningful to them. #3 – Shift your outlook. Catherine Sanderson, professor of psychology, has written several books on mindset and happiness. In her words, “Those who approach life with a more positive mindset are happier regardless of their life circumstances.” In short, just think about turning lemons into lemonade. Though acknowledging that some of us have a genetic head start, Sanderson maintains that thinking positive thoughts can actually change neural pathways in our brains. When our lower schoolers add to their gratitude journals, they are setting themselves up to be happy. Secondly, Sanderson advises that we spend time with people who make us feel good. Studies show that having a happy friend increases your own happiness. At TDS and elsewhere, happiness is contagious. #4 – Get rid of your phone. Those who know me well are surely aware that this story caught my attention. Rand Cooper ‘80 shared that he has been phone-free since being pickpocketed seven years ago. His reasoning is revealed in several questions he poses: “The history of innovation is littered with outmoded and discarded skills; nobody cares about not knowing how to shoe a horse or read Morse Code. But what happens when the skill we’re discarding is our ability to converse face-to-face? Or to write a complex sentence? Or to be alone with ourselves?” If Rand’s rant has piqued your interest, I encourage you to read “Have Smartphones Destroyed a Generation.” This thoughtful piece, published 18 months ago in The Atlantic, warns of multiple deleterious effects of these increasingly pervasive gadgets. For his part, Rand suggests holding off as long as possible before putting devices in the hands of our children. He also advocates for a weekend detox – lose the phone and reboot the actual human experience. If 48 hours seems like a lot to you, let’s start with time spent in carline at TDS! Use the digits 1, 3, and 5 to form 3-digit numbers. Do not use the same digit more than once in any 3-digit numbers. What is the third largest number that you can make? Consider the number: 437,b32. What is the largest digit which can replace b to make this number divisible by 3? Josephine read nine consecutive pages from a certain book. The sum of the page numbers she read is 378. On what page did she start reading? 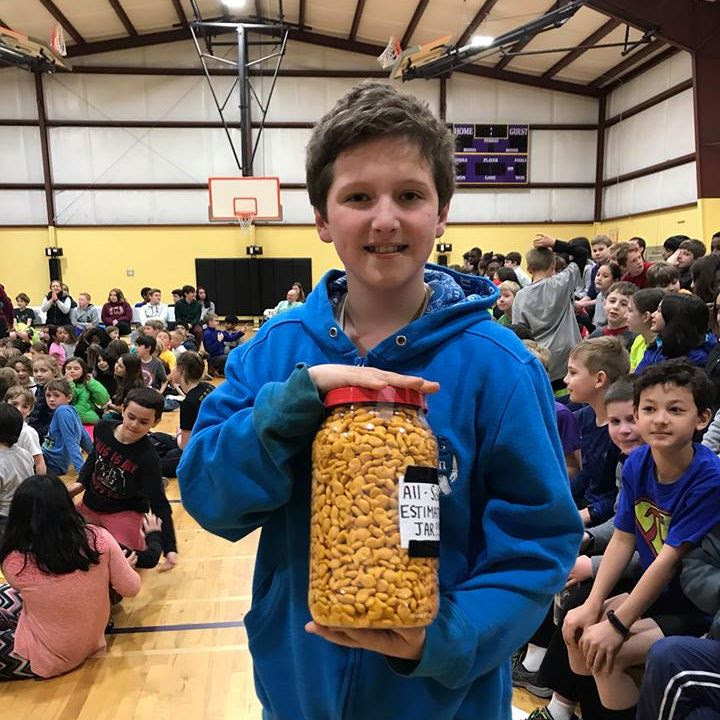 Kai Norcross won the Estimation Jar with a guess of 1,725 goldfish, only one away from the actual number! #1 – How many perfect cubes are there between 100 and 1100? #2 – A class of 10 students is going to form groups of 2. How many different groups are possible? Finally, our grade-level winners came to the stage to recite as many digits of pi as they could. Congratulations to all eleven of these students, who exhibited great courage and also left us wondering how their memories work so well! Of course, the fun could not end without the annual “pie to the face” (or faces!). Click below to watch. Kudos to Mr. Spencer for volunteering. With the numerous activities, eager participation, and terrific spirit, our first annual Math Week at TDS was even greater than the sum of its parts! I hope to see several Lower School families continue the fun with numbers during tomorrow’s Bingo Night in the gym. Welcome to Science Week at TDS. 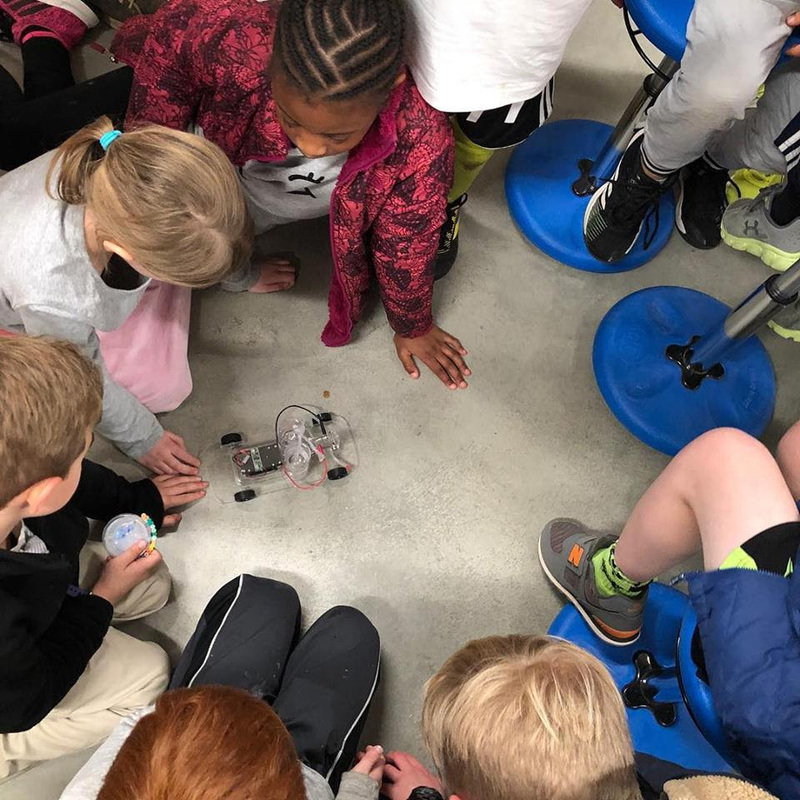 Lower School students have completed STEM challenges in Science Lab as well as their classrooms, Middle Schoolers have displayed and discussed their controlled experiments, and many students have been busy preparing for last night’s signature event. Many plants can grow without using seeds (Connor, 5th grade). Slime can be magnetic (Caleb, 2nd grade). Apples are better than other fruits when it comes to being a battery (Jenna, 4th grade). Larger light bulbs have less resistance (Matthew, 4th grade). Despite what people think, Froot Loops all taste the same (Conlan, 5th grade). Some plants grow better with aquaponics than with soil (Zoe, 2nd grade). Many of last night’s presentations were interactive. I found myself flapping a homemade bird’s wing to spin around in a chair and attempting to solve the Rubik’s Cube. During the second hour, students and parents migrated to the Hardin Academic Center, where physics and chemistry students from Duke University led a wide variety of engaging, hands-on activities, and the Trinity robotics team – featuring Ralph Erdmann (TDS ’16) and Eric Nelson (TDS ’16) – challenged our students to drive their robot through an obstacle course. It was wonderful to see so many of you supporting your children, and all of their peers, last night. In particular, I’d like to thank Dan Forringer, Karen Fisher, Erin Nelson, and Lori Khan for their hours of planning, organizing, and working with our young scientists. 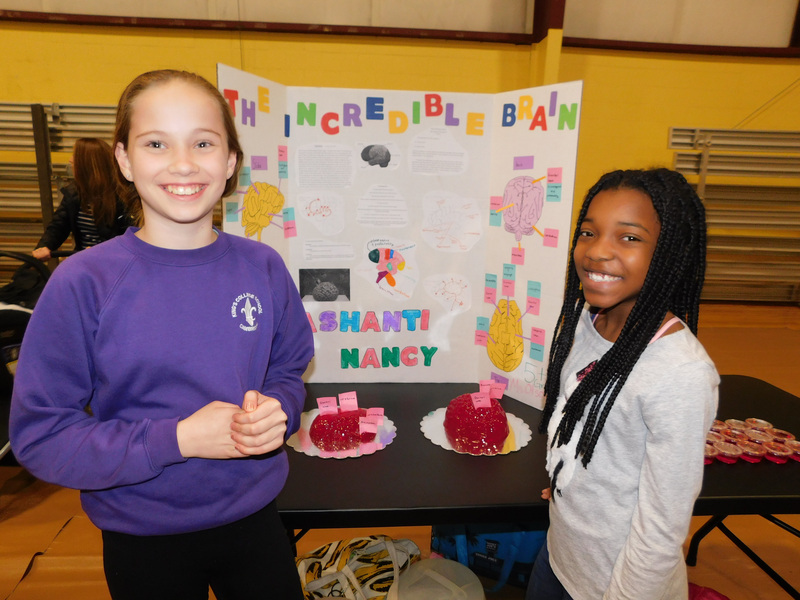 Our students chose a topic of personal interest, performed research, designed and carried out experiments, and displayed and explained their results. In true STEM fashion, Science Week is immediately followed by…you guessed it…Math Week. Check out all the fun planned for next week, and be sure your children are ready to participate. Monday – “Bring Your Rubik’s Cube to School” Day– Actually, this is pretty much every day for many of our Lower School students. On Monday, we’ll see if anyone is up to the task of solving the Rubik’s Cube. 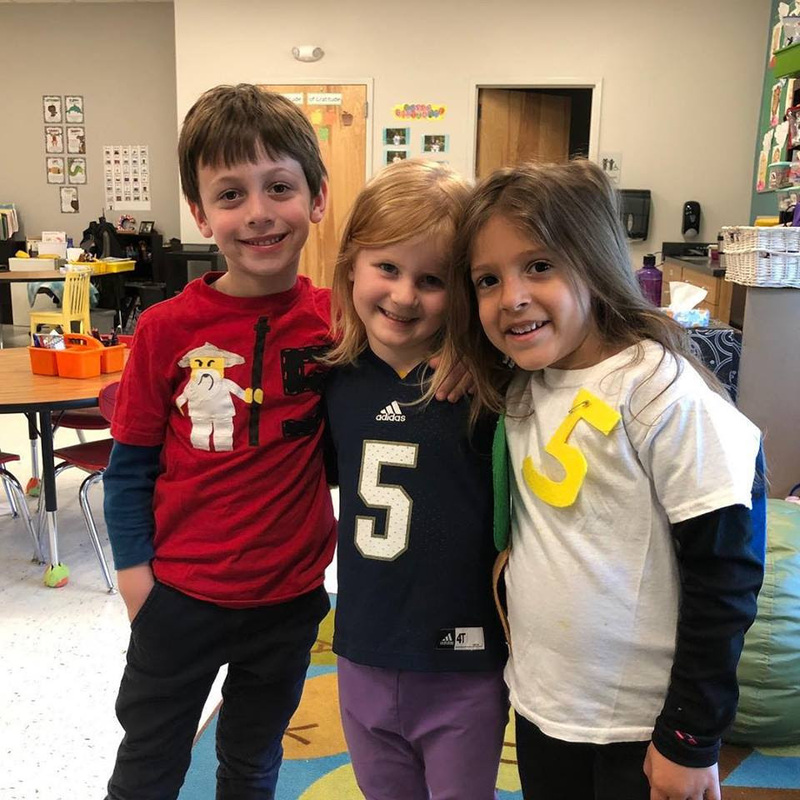 Tuesday – “Dress as Your Favorite Number” Day – All students should find a way to incorporate their favorite number into their wardrobe. An athletic jersey? Masking tape? We look forward to seeing creativity on display. Wednesday – “Dress as Your Favorite Shape” Day– Of course, math is about more than numbers. Does your child love squares? Circles? Lines? No matter the shape, let’s find a way to “wear it” proudly on Wednesday. Thursday – Pi Day – TDS veterans know that we are serious about celebrating Pi Day, and not even Spring Break can stand in our way. Pi shirts (purchased or homemade) are certainly encouraged, but the main task is to memorize the first 25 decimal digits of pi (3.1415926535897932384626433). Those who do will earn an oatmeal cream pie, and stand to recite the digits in unison during Thursday’s assembly. Problem of the Day – Students will have a chance to solve a challenging problem each day. Those answering correctly will earn a raffle ticket. We’ll pull some lucky winners for fabulous prizes during Thursday’s assembly. Students can also earn tickets by wearing creative outfits on Tuesday and Wednesday. All-School Estimation Jar – It won’t just be the Lower School doing the estimating. Middle Schoolers and teachers will be in on the act as well. 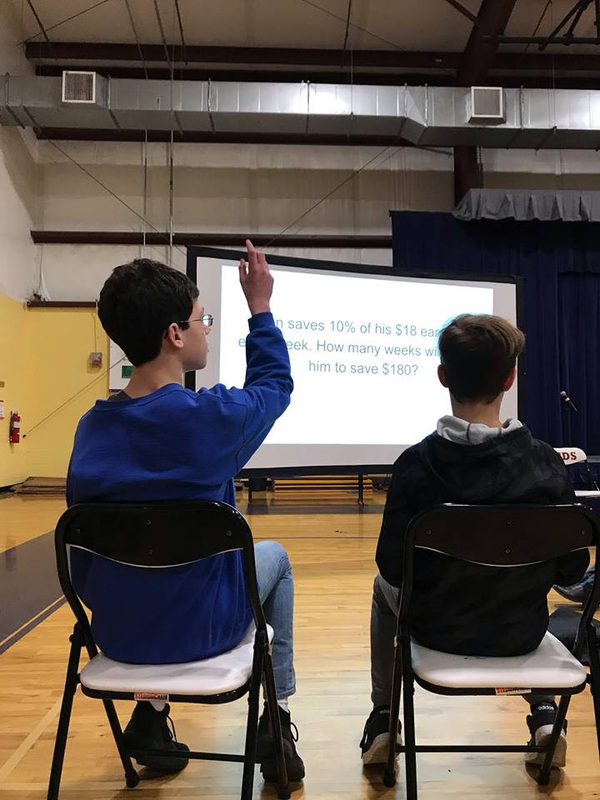 Grade-Level Competitions for Reciting Most Digits of Pi – As has become our custom, those who are so moved will recite as many digits as possible early in the week. Winners (one per grade level) will recite in front of the entire school on Thursday afternoon! We’d love to see you next Thursday at 2:05 as we come together for our signature Math Week assembly. To be clear, I love my three children…”to the moon and back,” as I used to read to them. Most days, I stand in awe of how they handle the challenges thrown at them, and what types of people they are in the process of becoming. That said, we all have our moments. Upon arriving home yesterday, I was greeted with this sight. 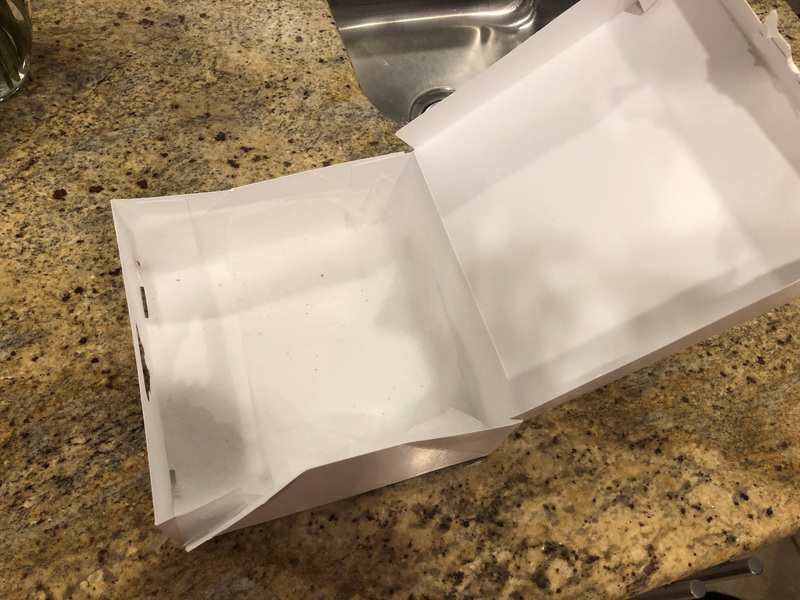 What specifically about the empty cookie box left on the kitchen counter caused my blood pressure to rise? My obsession with organization and order? My disdain for laziness? These no doubt contributed, but truthfully, it was my equating this act with self-absorption, and my newfound belief that our obsession with ourselves is the root of so many problems in our world. It’s not a coincidence that, just the night before, I finished reading Unselfie: Why Empathetic Kids Succeed in Our All-About-Me World by Michelle Borba. The author’s thesis is twofold. First, empathy is “the one human capacity that allows us to link minds and hearts across cultures and generations to transform our lives” (xii), a true antidote to bullying, racism, and similar insidious practices of demeaning and disparaging others. Second, rather than an innate characteristic, empathy is “composed of teachable habits that can be developed, practiced and lived” (xiii). Given these two points, the development of empathy in our children should be a primary goal, both at home and at school. Empathetic children have a moral identity. Borba cautions against the over-praised generation, raised on the participation trophy. Instead, she encourages parents to align praise with character, identify core values within our homes, and even create a motto as a family. Empathetic children understand others’ needs. Focusing on how to intervene when our children fall short in this area, Borba posits that timeouts – when a child sits alone – are not necessarily more effective than spanking or yelling. To be sure, parents should call out and express disappointment over episodes of uncaring. We might also role play and even create scenarios at home where parents and children switch roles for a period of time. The Berenstain Bears and the Trouble with Grownups for a creative illustration of this. Empathetic children practice kindness. Several studies point to a link between performing kind acts and feeling happy. Moreover, kindness is contagious in any community. At TDS, Mrs. Durham consistently encourages all of us to be bucket fillers. We even have public places to write compliments. This could work just as well at home. Beyond the specific examples, two of Borba’s points hit home with me. One, “empathy is driven by face to face connection” (218). Contrast this with a national survey in which 62% of kids rated their parents as “too distracted” when they try to talk to them (10). If we want to raise empathetic children, it starts with putting down our screens. Secondly, Borba links empathy to success and happiness. This isn’t simply about engendering moral courage and thus making the world a better place. To return to Mrs. Durham’s world, happiness isn’t achieved through the selfie; the best way to fill our own bucket might just involve filling the buckets of others.